It’s tick season. Learn more about how to prevent, remove, and identify the risks behind these blood-sucking arachnids. The other day I felt a bump through my jeans. Thinking it might be a rogue pimple, I went to the bathroom and dropped my trousers to inspect the bump. My wife heard my high-pitched scream from across the house and came racing to the room. My eyes were glued to the small brown tick, sucking at my hamstring. Spring is a common time to see ticks. And not much this side of the leech rattles this GearJunkie as much as these nasty arachnids. But fear not. Ticks are preventable and yes, you too can remove a tick. We caught up with emergency room physician Jason Quinn to get the skinny on how to prevent tick-borne disease. Quinn, an elite-level adventure racer with Team Bones, has pulled more than a dozen ticks off his own body and yanked countless ticks off his dogs. Here are some quick tips to managing the little buggers. Ticks are arachnids with eight legs (not six) and tear-drop shaped bodies. They come in three sizes: large (adults), medium, and the small, sesame seed-size nymphs. There are over 80 kinds of ticks in North America. With an increasing population of deer living in the places we play, we are also seeing the rise of deer ticks — the ones that most frequently transmit Lyme disease. Blacklegged ticks (also known as deer ticks) are reddish-brown, with a hard protective shield (called the scutum) behind the head. Ticks don’t fly. They hook onto hair, socks, or clothing and crawl up the body then latch to your skin. 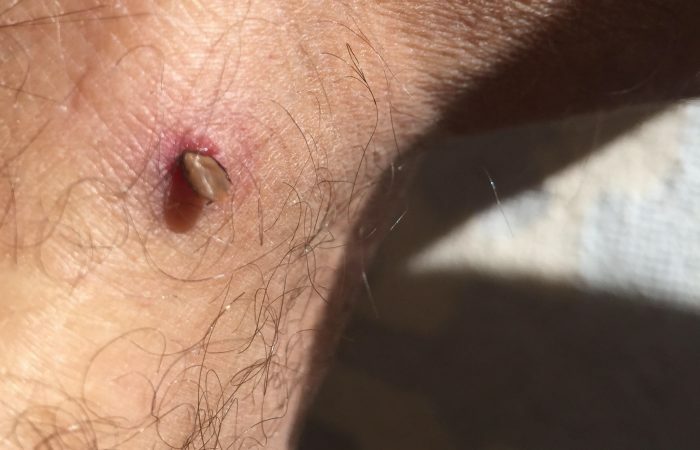 The best way to prevent a tick bite is to wear long pants. Going on a run as I was, insect repellant containing at least 20 percent DEET can also help deter ticks, according to the Center for Disease Control (CDC). In high-risk areas, treat clothing with permethrin. This strong repellent will also keep away mosquitoes, but it is not intended for application on skin. Some clothing designed to repel insects comes pre-treated. At home, consider treating your pets with one of many available products to keep ticks from latching onto your furry friends. As a natural alternative, citronella is listed by the EPA as an effective deterrent for ticks and mosquitoes. However, it requires hourly re-application, the agency states. Ticks are easy to miss. Their bites can be painless and they often climb up under clothing and bite in hard-to-see places. Quinn recommends the best prevention is to check your body carefully after your run and while in the shower. Found a tick? The best way to remove a tick is to pull it out with tweezers, according to the CDC. Small pointy tweezers can remove even the smallest, nymph ticks. Grasp the tick as close to the skin as possible and pull the tick straight out like a splinter. Don’t try to pry it or “unscrew” it. Afterward, wash the area with soap and water. Do not apply vaseline, alcohol, nail polish remover, or try to burn it off or squish the tick. This can cause the tick to regurgitate its dinner and cause infection. Without a doubt, ticks are gruesome critters. But fear not, most tick bites are harmless. 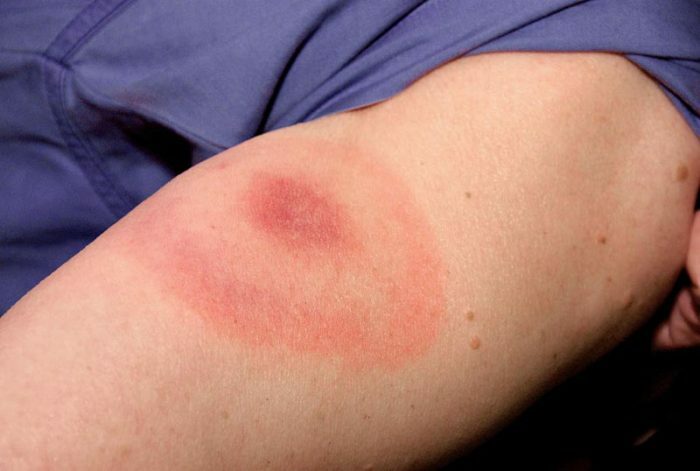 Most Lyme disease-transmitting ticks live on the east side of the Rockies, with higher populations in America’s Northeast, Minnesota, and northern California. Tick-borne illnesses are most often transmitted after 24 hours of exposure. The sooner you remove the tick, the less likely you are to get an infection. 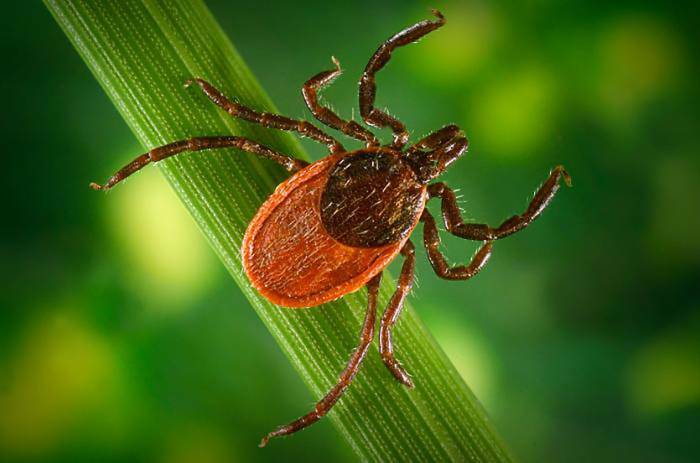 See a doctor if you can’t remove the tick, find a telltale bull’s eye red ring growing around the bite area, or have flu-like symptoms, including headaches, fever, aches, and fatigue. 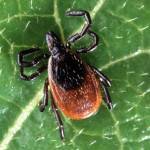 Symptoms can occur within days or weeks after removing a tick. So stay vigilant. Lyme disease is treatable and recovery is often complete. In all my years of running, riding, and cross-country junkets, I’ve only encountered two ticks. One I found crawling on my skin while in the shower. The second I found last week, latched to my skin. Like most things, the best protection against ticks is knowledge. Check your body frequently and wear insect repellant.